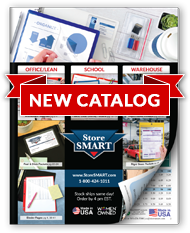 StoreSMART's Window Frame Style Document Holders are a convenient 8 5⁄8" x 11 5⁄8" size, perfect for labeling, as well as incorporating 8 ½" x 11" printouts into your 5S or visual management displays. Each holder is open on the long side to make swapping paper labels a breeze, and designed to frame your content with an attractive ½" border. Color-code your information to bolster employee comprehension, or utilize a variety of shades to bring a touch of color to your next meeting. Teachers: These holders are a fantastic addition to your educational toolbox. Use them to create large, tiles to facilitate visual learning (e.g., number tiles for math learners, alphabet tiles for reading students).